q know how to use the discrete fourier transform to convert a waveform to a spectrum and vice versa. The most flexible way to perform spectral analysis is to use a bank of bandpass filters. A filterbank can be designed to provide a spectral analysis with any degree of frequency resolution (wide or narrow), even with non-linear filter spacing and bandwidths. A disadvantage of filterbanks is that they almost always take more calculation and processing time than discrete Fourier analysis using the FFT (see below). To use a filter bank for analysis we need one band-pass filter per channel to do the filtering, a means to perform rectification, and a low-pass filter to smooth the energies. In this example, we build a 19-channel filterbank using bandwidths that are modelled on human auditory bandwidths. We rectify and smooth the filtered energies and convert to a decibel scale. % energies to 100 frames per second. Output is in decibels. The input to this function is a waveform, x, sampled at fs samples/second. The output is a table of energies, e, in which each row represents 10ms of the signal, and each column the energy in decibels found in a band-pass filtered frequency region at that time. The discrete-time discrete-frequency version of the Fourier transform (DFT) converts an array of N sample amplitudes to an array of N complex harmonic amplitudes. If the sampling rate is Fs, the N input samples are 1/Fs seconds apart, and the output harmonic frequencies are Fs/N hertz apart. That is the N output amplitudes are evenly spaced at frequencies between 0 and (N-1).Fs/N hertz. To compute the DFT in MATLAB, we use the function fft(x,n). This function takes a waveform x and the number of samples n. When n is less than the length of x, then x is truncated; when n is longer than the length of x, then x is padded with zeros. The output is an array of complex amplitudes of length n. You can obtain the magnitude of each spectral component with abs(), and its phase with angle() (result in radians). The fft() function calculates the discrete fourier transform in the most efficient way possible, but transforms of length 2m (m=integer) are considerably fastest to calculate. Use sizes of 512, 1024, etc for the fastest speed. 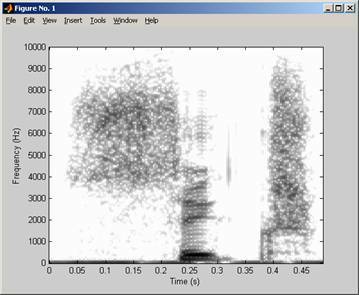 MATLAB has a built-in function specgram() for spectrogram calculation. This function divides a long signal into windows and performs a fourier transform on each window, storing complex amplitudes in a table in which the columns represent time and the rows represent frequency. Here, nfft is size of the fourier transform, use this to control the number of frequency samples on the vertical axis of the spectrogram; fs is the sampling rate of the input signal; window is the number of input samples per vertical slice, use this to control the analysis bandwidth; overlap is the number of samples by which adjacent windows overlap, use this to control the number of vertical slices per second. The output B is a table of complex amplitudes; f is a vector of frequency values used to label the rows, and t is a vector of time values used to label the columns. An essential introduction to spectral analysis can be found in Rosen & Howell, Signals and Systems for Speech and Hearing, Academic Press, 1990; ISBN: 0125972318. Units 5 and 6 from the Introduction to Digital Signal Processing course at http://www.phon.ucl.ac.uk/courses/spsci/dsp/ provides more mathematical detail about fourier analysis and windowing. 1. Write a program (ex91.m) that asks the user for a filename (WAV file), then loads the first 1024 samples, applies a Hamming window and calculates the power spectrum. 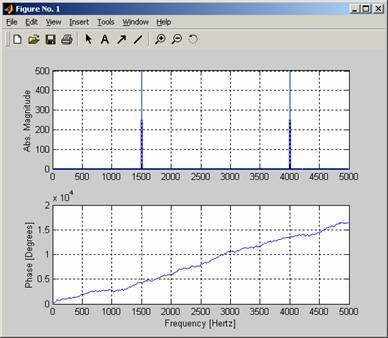 Plot the windowed signal and the spectrum on a single figure with waveform at the top and the spectrum at the bottom. Make sure you express the spectral amplitudes in decibels. 2. Adapt the last exercise (ex92.m) to calculate and display the average spectrum for the whole file. 3. Write a program (ex93.m) that calculates a high-resolution linear filterbank analysis of a given file and displays the results on a grey scale, following spectrogram conventions. Use at least 128 overlapping band-pass filters with bandwidths of 300Hz and an output rate of 1000 frames/sec. 4. (Homework) Write a program that filters a signal in the frequency domain. 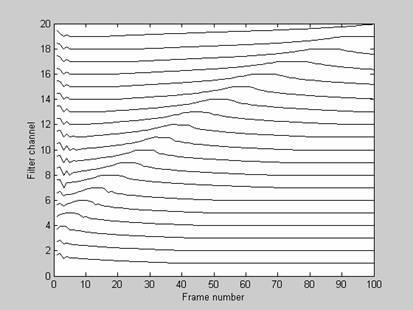 That is: it takes a signal, divides it up into overlapping window segments, then for each segment calculates a FFT, modifies the spectral magnitudes according to the required frequency response, then performs an inverse FFT to make a filtered segment. The filtered segments can then be added together to create the filtered output signal.